I love my dogs. They are my babies and are spoiled so much to the point where I am constantly making them new pet beds to lounge around the house, the car or even when we go camping. This recent bed was made from an old dresser drawer that I picked up at a local flea market for a few dollars. It had a beautiful front and was in really great shape...it just needed a face lift. First step was sanding all of the old paint then smoothing out some but not all of the wear and tear. *Smoothing out all of those edges so that it will not hurt your pet or yourself. Next, I prime the entire drawer with KILZ Latex Primer. This helps stop mold from growing and is safe for your pet. This is where I get out of control with paint and cover myself and what I am working on...so missing a few photos because I dare not touch my camera with messy fingers. But I put a layer of dark tan and garden green. Then I take furniture wax and a rag and rub the wax all along the edges, corners and general areas where I want it to look distressed. 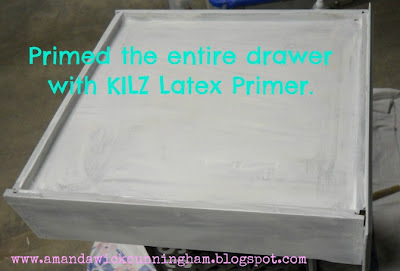 Then I put a last coat of white paint and let it set until dry. Once it is dry I use a soft steel wool and rub it on the areas where I had put the furniture wax. If you want an even rougher look, you can use a light grit sand paper and sand until you get the look that you want. Then just added my own vintage glass drawer handle and four wood bun feet...VOILA! A pet bed for a Puppy Princess! Any questions or suggestion, I would love to hear from you. Entering this project in The CSI Project Contest. CUTE idea! I struggled for years to find a pet bed I could actually have in my living room. I wish I would have though of this! Very creative! 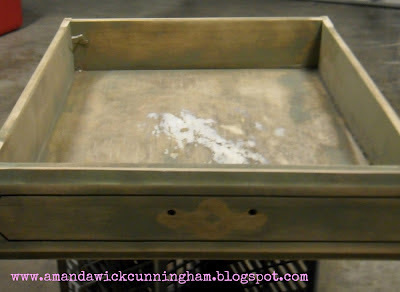 What a great use of an old drawer. It turned out great! Thanks so much! My little Meja is really loving it and it looks fantastic in my living room. So cute!! Have you seen the one where they turned a table upside down and did a similar treatment?? I have a larger dog, so I don't think a dresser drawer would suffice! Anyway, since you mentioned you like to make different beds, I thought I would turn you on to that option. A shabby chic artwork for a super cute dog! Your furbaby will surely feel like a royalty in there.